This whole area of north Bedfordshire is of great archaeological importance. There has been human occupation of the area since early prehistoric times, with the river valley being the focus of activity. The Park itself has a rich history of human activity which was uncovered in excavations prior to mineral extraction. The remains of an Iron Age farm dating back to the first century AD and evidence of a Roman Settlement have been found. The area remained as farmland until sand and gravel were extracted after the Second World War. 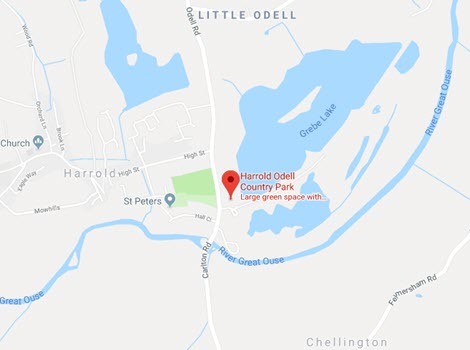 Once the extraction had finished, the area was restored to farmland with the addition of the lakes - a common feature along Bedfordshire's quarried river valleys. Photographs of this quarrying and its impact on the local environment can be found in the Gallery. The lakes rapidly became important for wildlife and the area was acquired by Bedfordshire County Council for a Country Park in the 1980's. 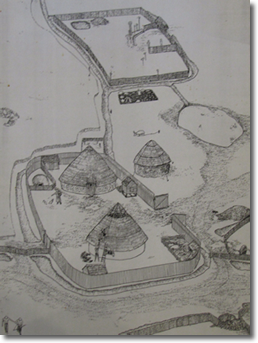 The drawing on the right is an artist's impression of the farmstead that occupied a site below the water of Grebe Lake, between the Visitors' Centre and the island. Prior to the 3rd Century AD you would have seen the series of circular buildings that formed a farm surrounded by a 20 hectare (50 acres) fenced enclosure protected by a ditch. The occupants were probably an extended family of about 20 people (including aunts, uncles & cousins etc.) who lived off cereal crops and animals that probably included cattle, sheep, pigs and horses. Although they were near the river, they drew their water from carefully prepared wells. These penetrated the water-table to a depth of up to 2 metres (approximately 6 feet). Some were lined with wicker basket work which formed a crude filter. When the site was excavated in the mid 1970s, archaeologists also found a number of wells with stone linings. The evidence of the people who lived on the site was provided by the remains of several burials that included the one illustrated here. The earliest graves lay in small cemeteries where whole pots were buried alongside bags containing cremated remains. 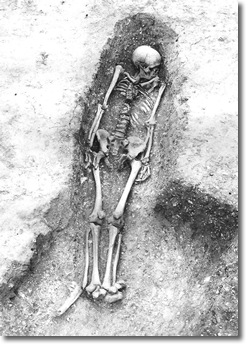 Excavated skeletons included those of infants and older children. It is unusual to find burials and cremations on the same site. More information and photographs relating to this archaeological site can be found on our Information Sheets.